In this age of quick images captured by mobile phones and tablets, quality photography takes a backseat to speed, expediency and instant gratification. So what can make your images stand out? 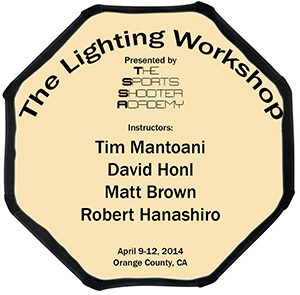 The Sports Shooter Academy will be holding The Lighting Workshop April 16-19, 2015 in Orange County, Calf. featuring a diverse and award-winning lineup of inspirational instructors. The Lighting Workshop is a hands-on, educational program that will take participants step-by-step through the process of creative portrait lighting. Know the difference in the quality of light between a softbox and beauty dish? A grid spot and strip light? What is the best use of a ring flash … or is there one? Does size matter? Can speedlights do the same job as a set of studio strobes? The Lighting Workshop will feature classroom sessions on modifiers, working with your subjects, understanding light and shadows, with an emphasis on how this applies to the work you do. Two days of shooting under the guidance of the workshop faculty, utilizing both studio strobes, portable lighting systems and speedlights, follows the day of classroom instruction. Workshop participants will receive one-on-one critiques from the instructors each evening. The Lighting Workshop will conclude with a slideshow and discussion of the participants’ work, followed by a roundtable discussion. As with all Sports Shooter Academy programs, the interaction between the faculty and workshop participants provides a unique opportunity for learning and inspiration. This workshop will also give participants access to cool gear from companies like Dynalight, Honl Photo Modifiers and PhotoFlex.